Melilotus siculus is a flood tolerant legume which in addition to high root porosity and a barrier to radial oxygen loss also possesses phellem. Phellem is a spongious tissue that greatly enhances oxygen diffusion from the atmosphere and into the root system. Natural wetland plants possess root traits to enable growth in waterlogged soils. The most widespread trait is a porous root cortex, which facilitate gas phase diffusion of oxygen from shoot base to root tips. Gas phase diffusion is 10,000-fold faster than molecular diffusion in water and thus, high porosity (gas filled) tissues can greatly enhance survival in anoxic waterlogged soils. Another important root trait that facilitates growth in waterlogged soils is a barrier to radial oxygen loss (see the figure below). A barrier to radial oxygen loss (ROL) is one of the most essential adaptations to root growth in waterlogged soils. 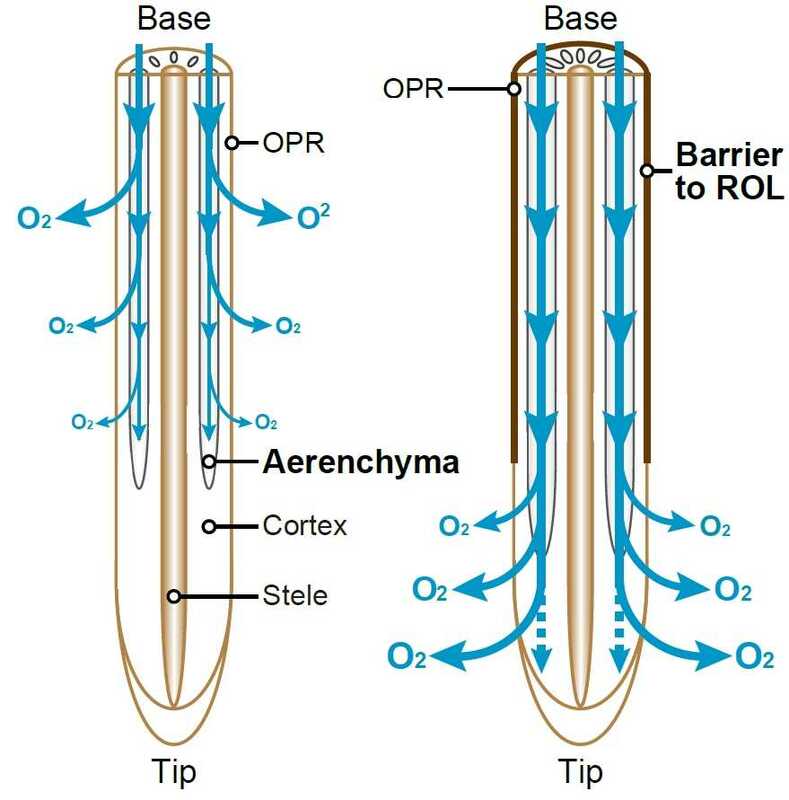 The barrier prevents radial diffusion of oxygen from the root tissue to the soil and thus internal aeration is greatly enhanced. However, the barrier is not formed in the youngest portion of the root at the very root tip and here, oxygen diffuses into the rhizosphere. In seagrasses, for example, the resulting oxic shield play an important role in oxidizing poisonous sulfide to harmless sulfate. 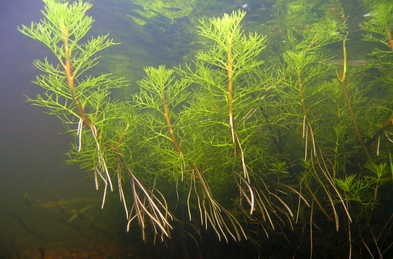 Aquatic adventitious roots forming during submergence in Meionectes brownii. 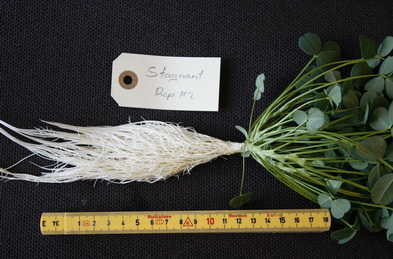 Some root turn pink or green and become photosynthetic so that they produce their own source of carbonhydrate and may more importantly, also oxygen. A schematic diagram showing the difference between a root which is acclimated to oxic conditions in a drained soil (left) and the the response to anoxic waterlogged soils (right). The gas-filled porosity of the root to the right is high and a barrier to ROL has been formed. Diagram modified from Yamauchi et al. 2017.